With the return of fair weather following the windstorm of Tuesday night into Wednesday, it was time to head back to Mt St Helens, having passed it by three days earlier for Mt Hood instead (see trip report). I'd skied the two standard routes on St Helens (Worm Flows and Monitor Ridge) several times, but the route up the Dryer Glacier on the southwest side has the appeal of going directly to the true summit, without the annoyingly long traverse needed from the other routes. However, the approach via road and trail is somewhat longer than the other routes. After skiing in Newberry Crater on Tuesday (see trip report), I'd spent Wednesday at Mt Hood Meadows, enjoying their last week of operation this season and often skiing at warp speed with a 30-40 mph downhill tailwind. Wednesday evening, I headed north to Hood River and then to Mt St Helens via the back way, across the Columbia River bridge, then west to Carson and north on the Wind River Highway (FR 30) to FR 51 and FR 90, joining the usual FR 83 and FR 81 south of St Helens. I car camped at Marble Mtn Sno-Park and then drove back 3 miles to FR 81 the next morning. FR 81 was snowfree to 2700 ft, 2 miles past Cougar Sno-Park and nearly to the turnoff for Climbers Bivouac. I skinned up the road at 7:30am, after watching a pair of climbers get their car really stuck while trying to force their way through the foot of snow blocking the road. They would be the last people I'd see for the next 9 hours, as I enjoyed complete and utter solitude on a beautiful day on what is usually one of the busiest of the Cascade volcanoes. I skinned 1.5 miles to Redrock Pass (3100 ft) and the Toutle Trail 238, crossing a few lengthy bare patches on the road. 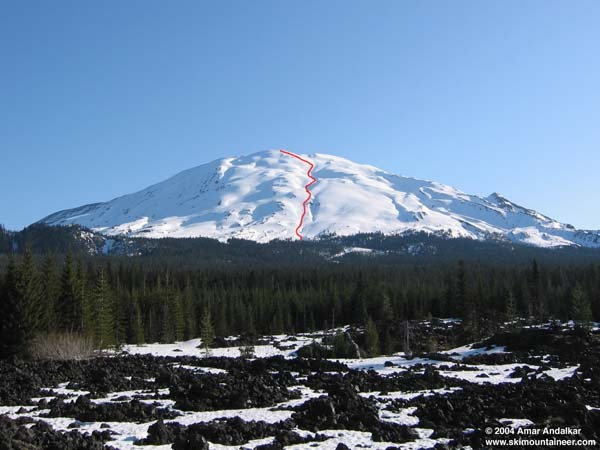 Unfortunately, the snow nearly vanished on the lava flow here, and I was forced to carry the skis the next half-mile to the edge of the woods. Here, the continuous snow returned and the trail became impossible to follow, and I spent quite some time thrashing northward through the woods. The tip loop on my left skin also broke, necessitating a quick field repair using cable ties. Eventually, I reached salvation at 3300 ft, in the form of a perfect snow-filled halfpipe gully heading off to the NE. This is the outlet stream from the Dryer Glacier, and I skinned up it quickly all the way to timberline at 4600 ft and on up to 5500 ft, where it steepens considerably. Ski crampons could have allowed skinning all the way up, but it seemed faster to crampon on foot and so I made the switch. I followed the firmer snow on SW aspects of the shallow gully to avoid postholing, all the way to the upper end of the Dryer Glacier at 8200 ft and then angled left to reach the true summit by 1:30pm. Conditions were spectacular, sunny and warm with nearly-calm winds. The cornice at the summit was not overhanging at all, so it was safe to approach within a foot of the edge and look down at my shadow on the crater floor. None of the other parties climbing the Worm Flows route that day were making the traverse to the summit, so I was all alone on top. I skied down at 2pm, on excellent corn above 7500 ft but then softening rapidly on south and SE aspects. It was best to stay on SW aspects which had gotten the least sun, but by 6000 ft everything had turned to heavy mush. Too bad I'd wasted so much time in the morning thrashing around in the woods below. Anyway, I followed the Dryer gully down to 3750 ft, where it turns sharply west. I left the gully here and skied south through the open woods, hoping to rejoin FR 81 directly and avoid the lava flow at Redrock Pass. With some effort and traverses and skiing across logs and bare dirt, I eventually reached FR 81 near 3050 ft about 1/4 mile east of Redrock Pass, without removing my skis. A quick ski down the road brought me back to the car by 4pm. It looked like several cars had driven about 1/4 mile past mine during the day, opening two tire tracks up the snowy road. Overall, it was a great day despite the early routefinding hassle in the woods, skiing a somewhat remote and spectacular route with 5600 vft of ski descent and none of the circus atmosphere often found on St Helens. This photo shows the southwest side of Mt St Helens from the lava flow at Redrock Pass. The ski route above treeline is shown in red. Monitor Ridge and Point 5994 (Monitor Peak) are along the right skyline. Click here for a double-size version of this photo.